The local name of Broad Peak is Faichan Kangri. It is called Broad Peak because of its breadth at the top. It has also been called enormous triple-headed Breithorn (4.165 meters high three-headed peak of European alps) of the Baltoro. Mason surveyed the height of main peak at 8.047 meters (26.400 feet) in 1926. Spoleto measured more precisely 8.051 meters (26.414 feet) in 1929. While the official maps used in 1957 showed a height of 8.047 meters, todays maps show 8.051 meters as official height of Broad Peak main summit. In 1954, Dr. Karl M. Herligkoffer of West Germany tried to climb it. His original objective, however, was to climb Gasherbrum I. He is stated to have failed in persuading porters to carry loads beyond Concordia above the Baltoro glacier. Accordingly, the party carried the luggage and made an attempt, from the south-western side, through the lower Broad glacier. It however, did not meet with success because of a storm and a very low temperature. In 1957, an Austrian expedition came to Pakistan to climb this peak. It was led by Marcus Schmuck. Other important members of the party were Fritz Wintersteller, Kurt Diemberger and Hermann Buhl, who is considered one of the best known post-war Austrian climbers and the first climber to Summit Nanga Parbat. The group began a reconnaissance of a ridge on the western face of the mountain. 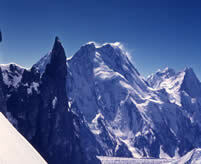 Consequently they climbed a snow gully and erected three camps at 5800, 6400 and 6950 meters. While climbing, they made the best use of ropes which were fixed by the 1954 German expedition. On May 29th, all members of the expedition left camp III for an assault on the summit and Fritz Wintersteller and Kurt Diemberger reached the Forepeak 8.030 meters. Late time and fog forced them to return to camp III. It was, however, on June 9, 1957 that Marcus Schmuck and Fritz Wintersteller, who climbed together, reached the summit at 5.05pm. They were followed by the second team, Hermann Buhl and Kurt Diemberger, where Diemberger reached the summit at 5.50pm and returned later to the peak together with Buhl. All four climbed the peak without using oxygen and high altitude porters. The last 23 porters left on May 6th, 7 km away from Base Camp and 40 additional loads were located 12 km away. The five "Sahibs" (Buhl, Diemberger, Schmuck, Wintersteller, Qader Saeed) and two Mailrunners carried 60 of these loads of up to 35 kg each to Base Camp. After the 2006 climbing season, our database counts 284 ascents to the Main Summit (8047m). See Broad Peak statistics by Eberhard Jurgalsk. Richard Sale, author of the book Broad Peak, provided the text below on this page. His book was published by Carreg Ltd. in the UK in 2004.You can purchase copies of the 1st edition signed by the author with your credit card or PayPal account. Below button leads you to the secure PayPal purchasing site. Note that some of the ascents listed below may only have been to forepeak. Definitive details on the actual point reached are occasionally hard to obtain. All credits for the data go to Eberhard Jurgalski. All ascents have been along the line of the first ascent (West Spur to Wind Gap/Broad Col, then over the Forepeak and along the summit ridge) except where stated. In reaching the summit Krystyna Palmowska completed the first wholly female ascent of an 8000m peak. She and fellow Pole Anna Czerwinska, after a semi-alpine ascent with two camps, reached the Forepeak. Unfortunately Czerwinska was forced to stop at the col between the Forepeak and the main summit, Palmowska continuing to the main summit alone. 1984 was the year of the repeat ascents, all five of the second ascents of Broad Peak recorded to date occurring then. The second ascent of Calcagno and Vidoni was the most remarkable, occurring just 16 days after their first ascent. Their first climb had been queried by other members of the team and so they did it again to prove a point. 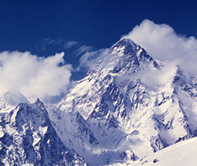 The ascent by Kukuczka and Kurtyka in 1982 had been unauthorised as they had, rightly, considered that Pakistani permission to climb minor peaks as part of the acclimatisation programme for a K2 expedition would not extend to another 8000m peak. The pair therefore returned in 1984. Their plan was to climb the, still unclimbed, south ridge to the main summit, then to traverse over the Central and North summits. Their alpine attempt on the south ridge failed because very hard climbing was absorbing too much time. They also had their tent ripped from over their heads by falling rocks. They therefore climbed the easier west ridge of the North summit, continuing along the ridge to the Central summit. The pair then descended to Broad Col from where they followed the original route over the Forepeak to the main summit, finally descending the original route. The climb required four bivouacs. On his second ascent Kurt Diemberger noted that the climb from Broad Col to the Forepeak was much harder than it had been in 1957. Carsolio soloed a new route to the right of the original route, climbing over Pt6230. His third bivouac was below the headwall to the Forepeak at his route’s junction with the original route, where Camp III of commercial climbs is usually placed. Bad weather then forced him to retreat. Later Carsolio climbed the original route to Camp III, that route having been prepared by other expeditions, and his earlier bivouac site. Here his stove exploded burning down his tent and removing his moustache. Undeterred by either loss he climbed the headwall directly to the Forepeak, then followed the original route to the top. He reached the summit as night fell and returned to Camp III where he was helped by a Basque expedition. In 1997 Ed Viesturs climbed Broad Peak on his way to a personal goal of climbing all 14 8000m peaks. Those who summited the following day noticed that his tracks ended at the Forepeak and questioned him about it. Viesturs was later to admit in print that he had not made it to the main summit. Despite this he did not return to Broad Peak until 2003. That year he climbed Nanga Parbat, leaving only Annapurna for the completion of his set. But as he was resting at Nanga Base Camp he was e-mailed by someone asking him if, as he was now in the Karakoram, he was going to reach Broad Peak’s true summit. This does not seem to have been part of his plan, but he immediately went to the Baltoro. On reaching the Forepeak again he found a group of South Koreans and their Sherpa companions celebrating. When he asked why he was told that it was a joint celebration - they had climbed Broad Peak and one of their number (Han Wang-Yong) had just become the 11th person (and the third South Korean) to complete the 14 8000ers. Viesturs pointed out that the celebration was premature as the main summit was still an hour away. To their credit, the South Koreans accompanied Viesturs to the real top. Benet, Meroi and Vuerich climbed Gasherbum I, Gasherbrum 2 and Broad Peak in 20 days (19/7 GII, 26/7 GI, 8/8 BP) one of the few ascents of three 8000m peaks in one year. The same feat had been accomplished in 1983 by Loretan and Ruedi in 15 days and by Sonnenwyl in 17 days. In 1985 Eric Escoffier has completed the much more difficult trio of GII, GI and K2 in 21 days. In 1975 a Polish team climbed Broad Peak's Central, or Middle, summit a team of six setting out for the summit on 28 July. The route was as for the 1957 climb to the Austrian Camp 1, then a line to the left. 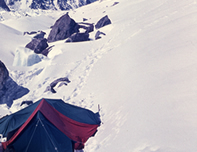 Two further camps were established, the last at 7200m below Broad Col. The Poles then climbed to Broad Col and followed the Middle summit’s final ridge. As the Col was reached in late afternoon, one of the six decided to retreat to the top camp. 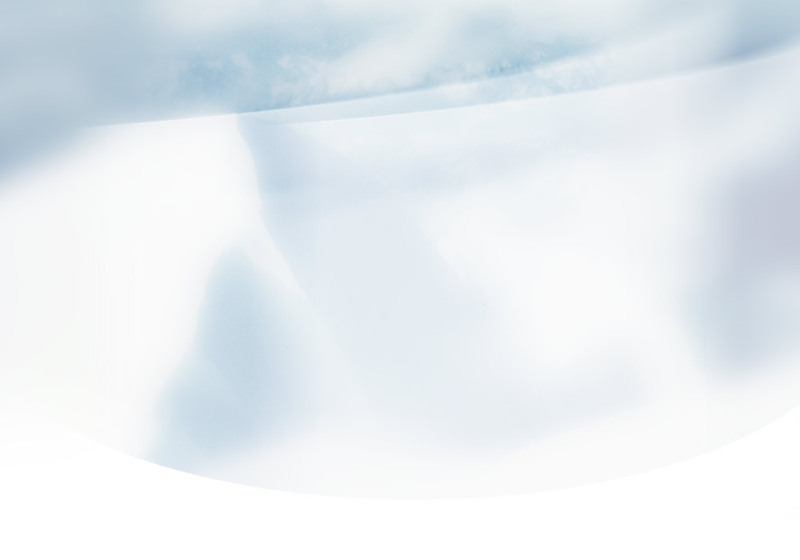 The remaining five climbed on, overcoming two major obstacles to reach what they believed, correctly, to be the summit plateau. By now it was late (past 7pm) and snow had begun to fall. The men sheltered behind a rocky section of ridge from where Kazimierz Glazek went on his own to see if they really were at the top. He was joined a few minutes later by Janusz Kulis. At about 7.30pm, the visibility improved momentarily and the two could see that they were on a high point. Their colleagues were about 40m away and a few metres lower. The two men hurriedly built a cairn and returned to the others. All five then started an arduous descent. During the descent the weather worsened, forcing the climbers to move on to the north-east face to avoid a violent blizzard. There, Bohdan Nowaczyk, the last man on an abseil, was killed when the rope anchor failed. Without a rope the four survivors were forced to bivouac. The next morning a search failed to find their companion or the rope and they tied slings together to form a makeshift line. The appalling weather made the descent painfully slow and another bivouac was inevitable. While searching for a suitable spot Andrzej Sikorski slipped, knocking Marek Kesicki and summiteer Kulis off. Only Kulis survived the fall, he and Glazek eventually making it back to the expedition’s top camp. Both were frostbitten, Kulis subsequently losing most of his toes. During their traverse of Broad Peak’s three summits Jerzy Kukuczka and Wojtek Kurtyka found the summit cairn built by Glazek and Kulis and were able to confirm it stood on the actual summit. Despite the fact that technical only the cairn-builders touched the summit, the Polish climbing press has, rightly, claimed that all five members of the summit team reached the top. 19 climbers (inclusive 2 female) have died on Broad Peak, four of them while descending from the summit. Data by courtesy of Eberhard Jurgalski.